Technically, letting his friends know his feelings IS facing ONE of his problems. He'd previously been unable to even face his team, and he's not hiding from them anymore. He's even telling them his feelings assertively. Progress! Not much to say about the art or the dialogue, except that I like having GB making a "time out" gesture and telling Dino-Mo to "hold her dinos" instead of "hold her horses". In other news, I finally did something I should have done a long time ago; I registered The Heroes Of C.R.A.S.H. at TopWebComics! If you're not familiar with that, it's a site that helps promote webcomics. You can vote for as many webcomics as you like once a day, and also "like" their Incentive Art to boost their popularity (Found by clicking the big thumbs-up button near the upper-left). You can find HoC in the Humor, Adventure, and Sci-Fi categories (Sadly, you can't just SEARCH for a comic through the site). Please vote for my comic so that more people can discover and read it! and while you're at it, please check out and vote for more Collective of Heroescomics on that site; we're trying to push our TopWebComics promotion this month. Don't forget to enter my #contest; all valid entries win ART! You have just a little over a month left! 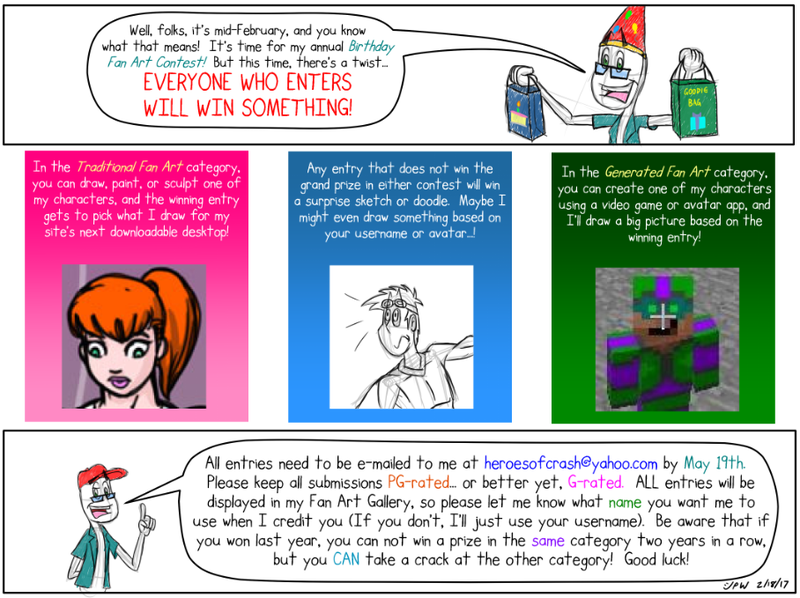 I have two entries for the main category and one for the Generated category, but the last month is when most of the entries come in. Don't wait too long!